A strong antiseptic, use as an inhalant for asthma, diphtheria, sore throats, sinus, and respiratory problems. Useful as a chest rub for coughs and excess phlegm, skin ulcers, and rashes. Take internally for typhoid, scarlet, and other fevers. Highly concentrated, use sparingly. Internal/external. Shake well. Store in cool, dark place. Keep out of reach of children. 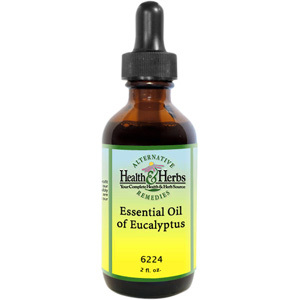 Essential Oil of Eucalyptus is shipped in a discrete, unmarked package. Orders are processed immediately and usually take about 3 to 5 working days to be received. Any information received is used only for order processing and shipping purposes. Your information, such as e-mail address, will never be disclosed to a third party.